Contact us to customize this trip for you. Day 1 Nairobi/Amboseli. 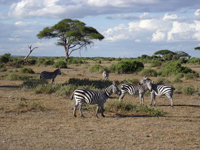 Morning drive to Amboseli National Park; lunch, afternoon game drive, dinner and overnight at Ol Tukai lodge FB. Day 2 Amboseli. Experience the majestic view of Kilimanjaro with morning and afternoon game drives, lunch, dinner and overnight at Ol Tukai lodge FB. Day 3 Amboseli/Treelodge. Afternoon drive to Aberdares. From a base hotel, transfer to special vehicles for drive to the Treelodge. 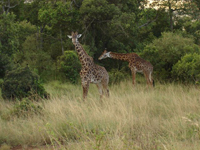 Tea, dinner and overnight game viewing from the verandas of the Treetops lodge FB. Day 4 Treelodge/Samburu. Morning drive across the Equator to the edge of the Northern Frontier. Lunch, afternoon game drive, dinner and overnight at Samburu lodge FB. Day 5 Samburu. Experience the unique Samburu; with morning and afternoon game drives, lunch, dinner and overnight at Samburu lodge FB. Day 6 Samburu/Mt. Kenya. Early morning drive and then proceed to the world famous Mount Kenya Safari Club to relax and enjoy the facilities. Afternoon free to take an optional excursion to Ol Pejeta Game Sanctuary or even a fishing trip nearby. Dinner and overnight at Mount Kenya Safari Club FB. Day 7 Mt. Kenya/Baringo. Morning drive via Nyahururu Falls down to Lake Baringo with picnic lunches. Later drive to the beautiful Lake Baringo. Evening bird walk. Dinner and overnight at Lake Baringo Club FB. Day 8 Baringo/Nakuru. Morning drive down the floor of the Rift Valley to Lake Nakuru National Park. Lunch, afternoon game drive, dinner and overnight at Lion Hill Sarova lodge FB. Day 9 Nakuru/Maasai Mara. Morning drive across the Rift Valley down to the Maasai Mara Game Reserve. Lunch, afternoon game drive, dinner and overnight at Mara Sarova Camp FB. Day 10 Maasai Mara. Experience the magical Maasai Mara; with morning and afternoon game drives, lunch, dinner and overnight at Mara Sarova Camp FB. Day 11 Maasai Mara/Nairobi. Early morning game drive, followed by breakfast. Return to Nairobi in time for lunch on on. CONTACT US FOR FOR INDIVIDUAL, FAMILIES, GROUPS, AND INCENTIVE SAFARIS. OUR PRICES ARE VERY COMPETITIVE WHEN ALL OF OUR SERVICES ARE TAKEN INTO ACCOUNT. Accommodation and meals as stipulated in the itinerary. Transport in custom built minivan or 4x 4 cruisers. Services of an English speaking tour driver-guide. All items of personal nature e.g. communication bills etc. Let Gaia Tours create the custom vacation of your dreams or your next group tour.